NEW DELHI: Samsung’s much-speculated clamshell smartphone, W2017, is finally official. Successor to the company’s earlier-launched W2016, the smartphone has been listed on the company’s China website. W2017 is available in Gold and Black colour variants. Similar to its predecessor, the Android-based clamshell smartphone features a dual-screen display. The overall design of the handset too remains the same except for some minor tweaks. Samsung W2017 sports a fingerprint sensor placed right below the rear camera. 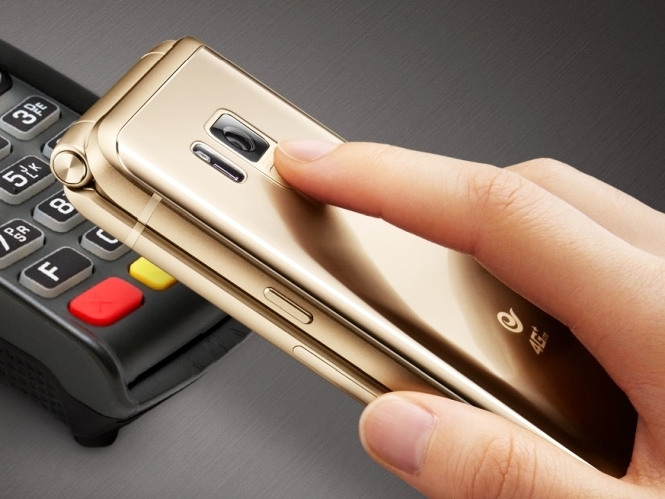 The fingerprint sensor can also be used to authenticate Samsung Pay wireless transactions. The all-new W2017 sports dual 4.2-inch full-HD (1080×1920 pixels) Super Amoled displays and is powered by a quad-core processor, clubbed with 4GB RAM. The device comes with inbuilt 64GB storage, of this 52.2GB is available to users. Support for microSD card (up to 256GB) is also included. The optics department is handled by a 12MP rear camera with f/1.7 aperture along with a 5MP front-facing camera with f/1.9 aperture. The camera also has the ability to record videos in 4K resolution. Some of the connectivity options present in Samsung W2017 are 4G LTE, USB 2.0, GPS, micro-USB, Wi-Fi, NFC and Bluetooth v4.1. Backed by a 2300mAH battery, the dual-screen smartphone is said to deliver standby time of 64 hours. It measures 127.8×61.4×15.8mm and weighs 208 gram. Launched in November 2015, W2016 comes with a dual 3.9-inch Super Amoled display with WXGA resolution, octa-core processor, 3GB RAM, 16MP rear camera, 5MP front-facing camera, 64GB inbuilt storage and 2000mAh battery. Earlier this year, Samsung launched its Galaxy Folder 2 flip-phone in China. Galaxy Folder 2 is powered by a Qualcomm Snapdragon 425 processor and packs 2GB of RAM.